Hello and welcome to AmplifyBlog. Let me take this opportunity to invite you all on this exclusive blogging community. My mission with AmplifyBlog is to promote and amplify blog content. This is something we do on GuestCrew already, but GuestCrew has it’s own set of protocols for promotions. We leverage the Guest Crew network for it’s promotions. Here we can try out a few other methods and perhaps be a bit informal in our approach. AmplifyBlog is strictly blogging and marketing community targeted to online marketing – we are strongly focused on the niche. And thus we can network and connect with other marketers easily. 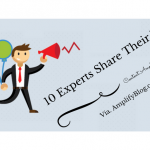 What are your top Content Amplification Strategies? Syndicate, syndicate, syndicate… share your content via all social channels always including Twitter, Facebook, Google+ and LinkedIn, which also makes it easy for others to share. And don’t be afraid to do it more than once, in a day, and periodically sharing old posts via your social channels, especially those that were well received. Also let others freely repost your content in full with a link back to the original post, and even without if they ignore the request, as long as your name is attached… people will seek you out. I create the original texts to go with each type of media, saving them on a template I created on Trello. My VA can then create duplications of these variations and schedule them out in rotation. By using different imagery and text, the same piece of content can be pushed more without annoying followers. I get amazing visuals for free from MavSocial and customize them right in MavSocial or download them and edit them using Canva or GIMP. First of all, I would like to thank Mr. Uttoran Sen for giving me an opportunity to speak up here to share something with his blog audience. Content amplification includes those strategies and techniques that you implement to get more audience to your content either via search engines, social media, direct or from any third party sites. In my opinion, organic traffic is the king of all other traffic sources because it gives the higher ROI than others. SEO is done in two phases, On-page, and Off-page. On-page refers to the optimization techniques that are done on the website such as writing meta tags, interlinking, keyword research & distribution, Heading tags optimization, image optimization, URL optimization, loading speed, Making the site mobile friendly etc. You may read my post on on-page optimization to know more about it. Off-page refers to the optimization techniques that are done off the website such as Link building. When it comes to content amplification, social media is the second most important and beneficial strategy. Most of us share our blog posts on social sites like Facebook, G+, LinkedIn, Twitter, etc. The blog posts generate a good amount of traffic from these social sites. Just be different, and share your content in a creative way either by writing attractive texts or by creating attention-grabbing images. This is the third most important content amplification strategies. I post nearly about 10-15 blogs after I publish an article on my blog. I mostly choose the commentluv blogs, so that when I comment on them, I can show my latest blog post link via commentluv. It helps me getting a few visitors from those blogs. In most cases, when there is a great catchy headline, then the CTR goes high. And I get tons of traffic from those blogs. In recent years, blog communities have been getting so much of popularity. You share your blog posts on them, and you get votes and comments from other users. To name a few, Kingged.com, bizsugar.com, klinkk.com, and dosplash.com are few good ones from where I consistently get few hits on a daily basis. Brian from backlinko.com termed this technique. What you have to do is to find content that is already on the internet but information is not complete or is written poorly, and then do a lot of research and try finding out what all have been written on that particular topic on the Internet. Once you are done researching, write content that is much better than those existing ones. In this way, you have repurposed the content that is already on the internet with less information. Write attention-grabbing headlines to increase CTR, thus more traffic. Use tools like Justretweet and Viralcontentbuzz to get most out of social media especially Twitter. Make social sharing easier by installing sharing buttons at the right places so that readers don’t feel lazy of sharing your content with their friends and followers. Link out to authority blogs, so that they can notice you, and they might share your content with their huge followers. Though there are hundreds of content amplification strategies, but I find these as the best ones and handy too. My top 3 blog amplification strategies are formal tribes, informal tribes and viral images. There are official set-ups like Viral Content Buzz, Triberr, Just Retweet, etc. There are actually dozens, perhaps hundreds of such services where you earn credit by sharing (or can buy credits), and those credits are spent when others share your posts. Most of them are pretty spammy. VCB, Triberr and JRT are the three that are best for quality. Triberr is a little different, because there are no credits. I’s all on the honour system. But it is worth your while to share your tribemates’ posts, because then you appear at the top of their streams for 7 days. I belong to a gazillion-and-one tribes, so I make the rounds to each tribe once a week and try to make sure I share something from almost everybody (well, I don’t share posts that are administrative in nature, so I do miss some people some weeks). Aside from sharing one per week from each tribemate, the other big factor in success on Triberr is to belong to many tribes. You can easily see which tribes are related to your blog topic (Do I have to point out the value of relevance?) and how many members and followers each one has. You can also start your own tribe to invite the exact people you want sharing your posts. That is so cool! I wonder why I have not yet done that. What I like about Viral Content Buzz is that it covers not just Twitter, but also Pinterest and FaceBook, as well as Stumble Upon. Interestingly enough, none of the three amplifiers brings me as much direct traffic recently as the blogging community at Kingged. 1. Post your link, and people will share if they like it. 2. Post your link and share everybody’s – no exceptions – by a certain deadline. Although I share almost any blog post offered up, I might not share them all on a specific platform. I am much more a fan of many small, voluntary tribes that huge circle-jerk tribes. Yes, the big ones might be very effective, but I don’t like being told I have to tweet everybody’s tweet in order to play. I should be able to choose if and where to share a post. But that’s just me. Many of these informal networks also have a minimum account strength stipulation, such as “You must have at least 5000 Twitter followers”. I love viral pics, because they spread like wildfire on most major social platforms. A viral pic is something people love to share, and since you are unlikely to be able to snap a pic of Kim Kardassian just as the wind takes control of her skirt, you’ll have to create your own pics. Here is my “formula”. Pull from your post a handful of poignant lines that will stand on their own. Tweetables, but you are not limited to 140 characters (although you should not make them too long). I find motivational and funny lines work best to give the pic the best sharability, but you will have to see what works best for you and your audience. Find an engaging pic at http://stocksnap.io/ , https://pixabay.com/ and http://morguefile.com/ that relates to it. Bright colors, an expressive face, etc. Ideally the pic has a large section of fairly even coloring. Place the text on the blankish section of the pic, and format the pic on http://picmonkey.com/ . Both the pics on this page http://thgmwriters.com/blog/point-of-view/ were built using this formula. After that, it’s all about sharing in as many Google Plus communities as fit, on as many Pinterest Group Boards as fit, etc. Collaborators are usually happy to amplify your content if you give them a Click-To-Tweet link. Click-To-Tweet links facilitate 1-click sharing, so for the amplifier, they’re effortless. You can even suggest them via Skype messages and SMS text. I like to ask one-on-one, or in a special Skype room dedicated to amplification. I like to plan which social media platforms I will use to amplify my content while I’m creating it, concentrating on as few as one or two platforms. A piece with a short, attention-grabbing title that can be augmented with humor or sarcasm is a great candidate for amplification through Twitter. To get real amplification, you I don’t just tweet it a few times, but seed it through social sharing co-op platforms like Viral Content Buzz and Just Retweet. When seeded with the right hashtags, platforms like these are like the volume knob on a stack of Marshall guitar amplifiers. Turn it up! This is especially nice because most social sharing co-op services don’t require paid spending. I also like creating content especially for StumbleUpon because posts there have the longest shelf life of any social media site that I know of. A gorgeously-formatted problem-solving list post works the best for me, especially if there’s budget to seed in StumbleUpon Paid Discovery. The number of ways you can amplify your content is seemingly endless. But if I had to name just one strategy then it would be going big with your content. Most bloggers put barely three or four hours’ work into each post. But with that level of attention it’s very difficult to make your content stand out. That’s why going that extra mile can make all the difference. Spend more time researching for, writing and formatting your posts. Bigger and better content generally grabs more attention. So get this bit taped and all your other amplification strategies will be magnified many times over. When I first started out, I was constantly trying to find out all the different ways of amplifying my blog. Get on Facebook and start a Facebook page. Hop on Twitter, grow your following, and send out relevant content. Create stunning pictures on Instagram. Begin “poaching” your competitors links. Connect with people in relevant Google, Facebook, and LinkedIn groups. Frankly, it can be exhausting. There’s a lot of influential people contributing to this piece. When you connect with influencers in a meaningful way, they can drive a lot of relevant traffic to your site. Influencers are incredible people who have spent a lot of time building expertise and social collateral. They deserve respect, and connecting with them isn’t just a one-way street where you win by getting free traffic and referrals. It’s a two-way street where you offer value and build authentic relationships. Doing a question round-up like this is one great strategy who can amplify your content to a highly relevant audience. In fact, one article I wrote received over 1,800 shares in 3 days, without an email list using this strategy. Not sure how to meaningfully connect with relevant influencers? Curious to find their email to begin engaging with them and not seem “spammy”? First of all I’d like to thank Uttoran for inviting me to participate in this Round-up, I really appreciate it. 1. My favorite content promotional strategy is emailing my list. When I send an email to my subscriber/customer list that has a link to a newly published blog post, I get a lot of traffic! Building a list of folks that know, like and trust you is the best “traffic on demand” method you’ll ever have. List building is THE most important thing you can do to grow your business (and income). When I guest blog somewhere I can always tell if the blog owner hasn’t put much emphasis on building a list. They email their tiny list and barely get a trickle of traffic to my guest post, and very few comments come in. What a shame. 2. My next fave method of content promotion is blogger outreach. Building relationships with like-minded entrepreneurs who have influence, and who find my content valuable, and are willing to share my content, is a huge advantage over doing it alone. The compound effect of sharing causes my content to be much more far reaching, being put in front of more readers than I could ever reach alone. That Concludes all the answers from the roundup. When I started blogging back in 2005 – there were very few blogs online and very few of them were on the “Blogging” niche. Over the years I found several bloggers who started out actively but slowly became passive and closed their shutters in time. While it is sad to see a blogger go away, to fill their places several others rise to the occasion and make their blogs count. A big thank you to the experts for giving us time and providing us with their expert answers. Before we part – please do join Amplify Blog. Looking forward to welcome you onboard. Thank you everyone for your time, let’s wrap it up here – until next time, am Uttoran Sen, signing-off.